Comes with paper playmat and First Guide for beginners. All cards are exclusive to the Trial Deck. Each deck contains 4 perfect defense cards and 4 Blaster Blades. 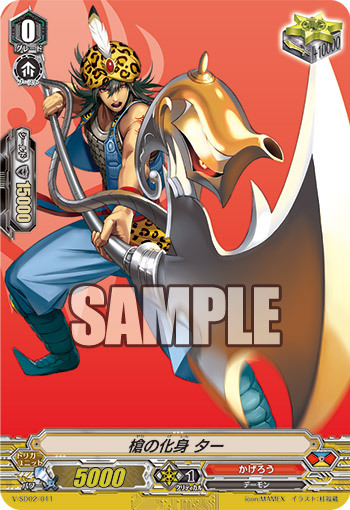 (1 illustrated by Itou Akira, 3 by Daisuke Izuka) Each display case contains six Trial Decks, and each Trial Deck within that case has a randomly inserted Itou Akira-signed hot stamp Gift Marker, or a signed hot stamped Dragonic Overlord. 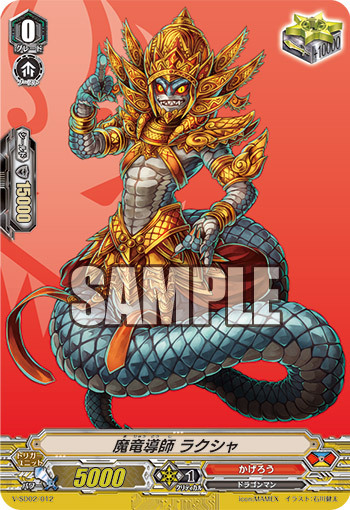 The Crested Dragon sleeve is available by preordering TD02. (Japan-only) 70 sleeves are included. 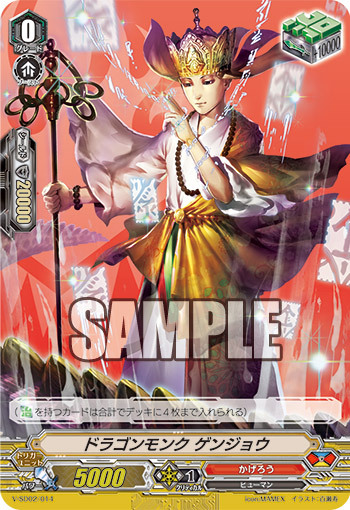 The Kai Toshiki sleeve is available by purchasing TD02 as a 2500 yen bundle, with comes with the sleeve and Dragon Monk Gojo promo. (Japan-only) 70 sleeves are included. 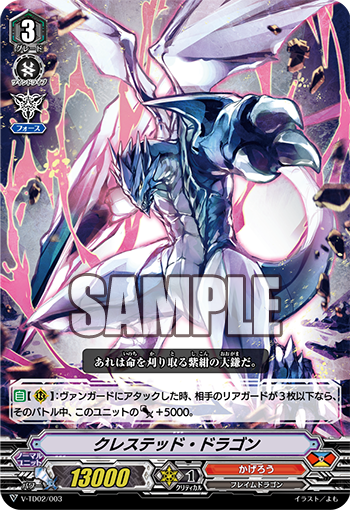 The Dragonic Overlord sleeve is available by preordering TD02 at one of the participating Spring caravan demo workshops for Standard format. (Japan-only.) 53 sleeves are included. The deck will come with three Force Gift Markers, two standard and one featuring Dragonic Overlord. 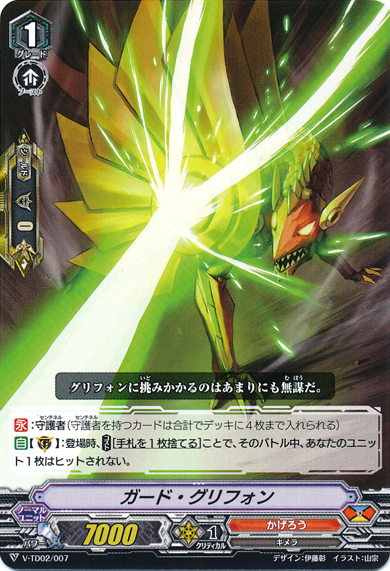 Activate [Vanguard/Rearguard Circle] Once per turn: [Counterblast 1] During this turn, this unit gets Power +10000. 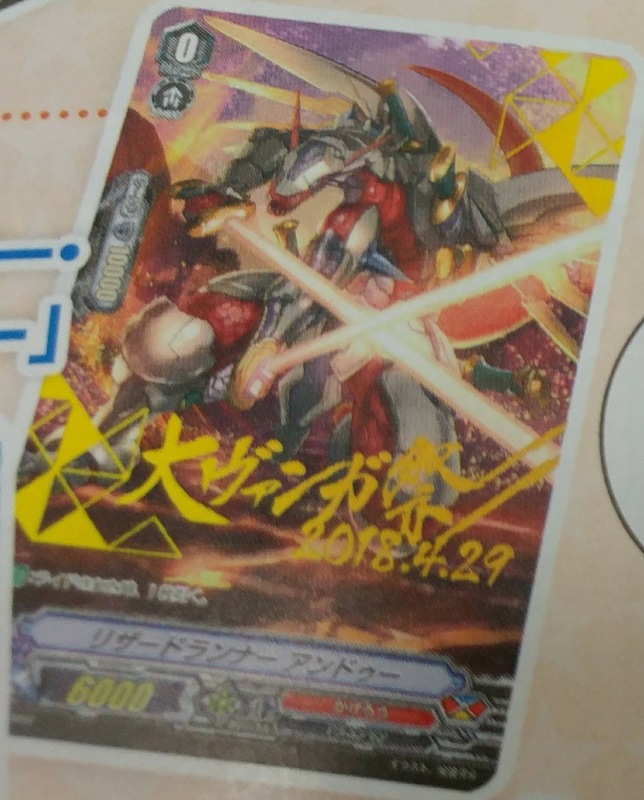 Automatic [Vanguard Circle] Once per turn: When this units attack hits, you may [Counterblast 1, discard 2 cards from your hand] to Stand this unit, during this turn, it gets Drive -1. 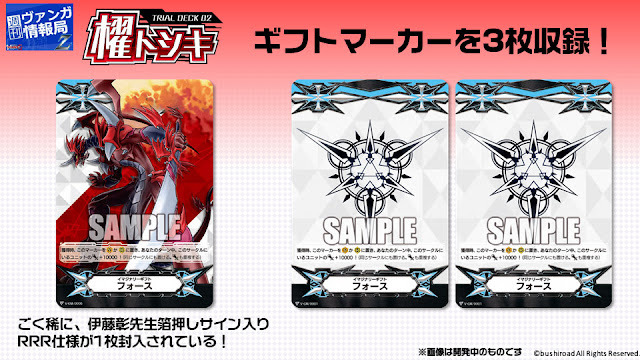 Trial Deck comes with 4 copies, 1 illustrated by Itou Akira and 3 by DaisukeIzuka. 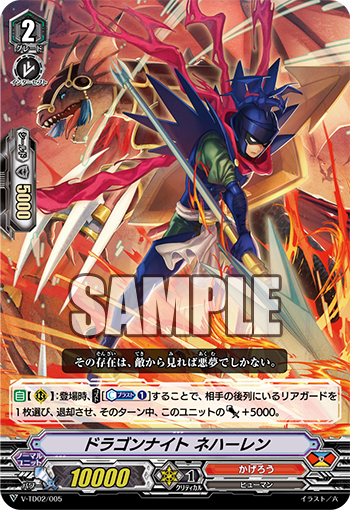 Automatic [Rearguard Circle]: When it attacks a vanguard, if the number of your opponent's rearguards is 3 or less, this unit gets Power +5000 until the end of that battle. First available in Start Deck 02. 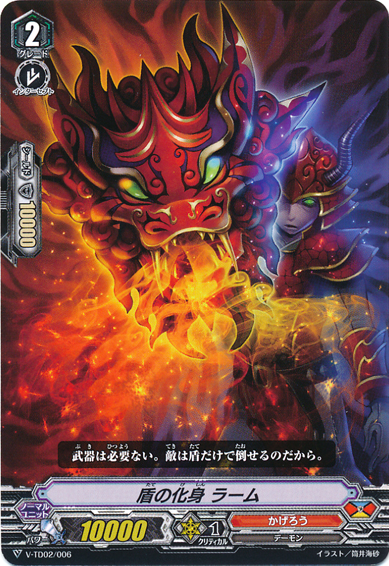 That version of the card gets +3k on either vanguard or rearguard circles if you have 3 or more rearguards. 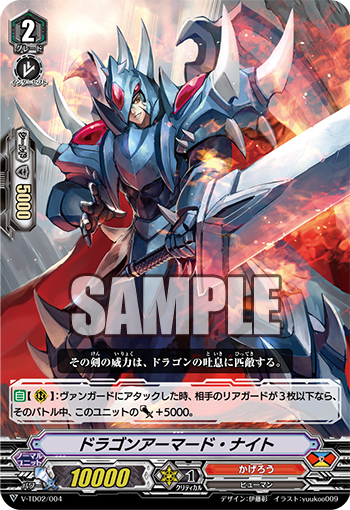 Automatic [Rearguard Circle]: When it attacks a vanguard, if the number of your opponent's rearguards is 3 or less, until the end of that battle this unit gets Power +5000. 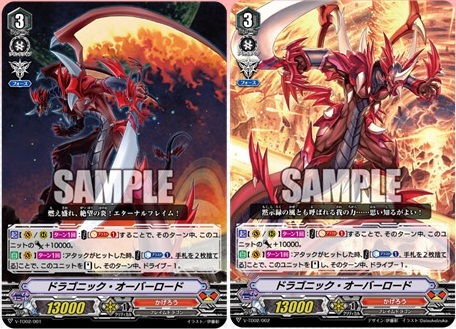 Start Deck 02 contains an alternate version of the card which gains 3k if you have a grade 3 or greater vanguard. 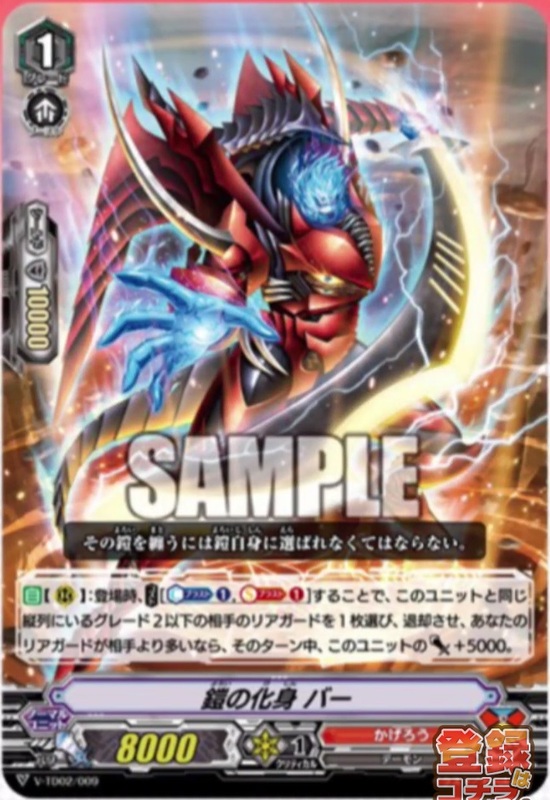 Automatic [Rearguard Circle]: When placed, by paying [Counterblast 2], choose 1 of your opponent's rearguards in the back row, retire it, and this unit gets Power +5000 until end of turn. 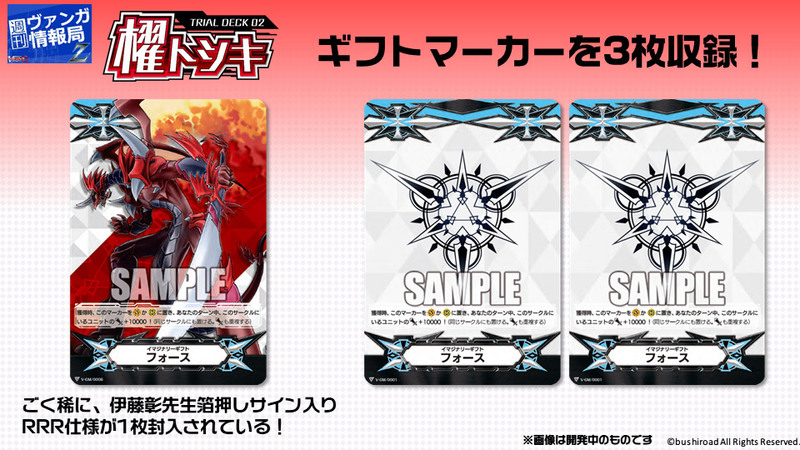 Demo deck version is a 9k base with 5k shield and Activate Counterblast 2 to retire an opponent's rearguard. Start Deck 02 version is identical, but with a different background. 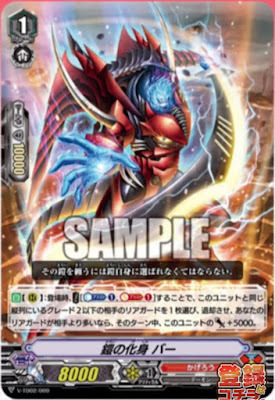 AUTO [Rearguard Circle]: When placed, by paying [Counterblast 1, Soulblast 1], choose one of your opponent's grade 2 or less rearguards on the same column as this unit, retire it, and if the number of your rearguards is greater than the opponent's, this unit gets Power +5000 until end of turn. Start Deck 02 has different background art, and is a vanilla. Automatic [Guardian Circle]: When placed, by paying [discard 1 card from your hand], during that battle, 1 of your units cannot be hit. 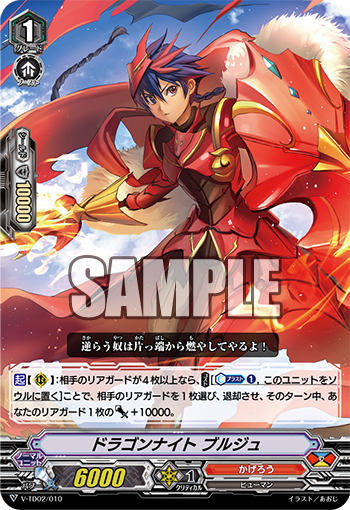 ACT [Rearguard Circle]: If the number of your opponent's rearguards is 4 or greater, by paying [Counterblast 1, put this unit into your soul] choose 1 of your opponent's rearguards, retire it, and until end of turn one of your rearguards gets Power +10000. Start Deck version is a 7k base that gains 3k while attacking a vanguard. Automatic: [Rearguard Circle]: When boosting, if the number of your rear-guards is greater than your opponent's, during this turn, the boosted unit gets Power +3000. 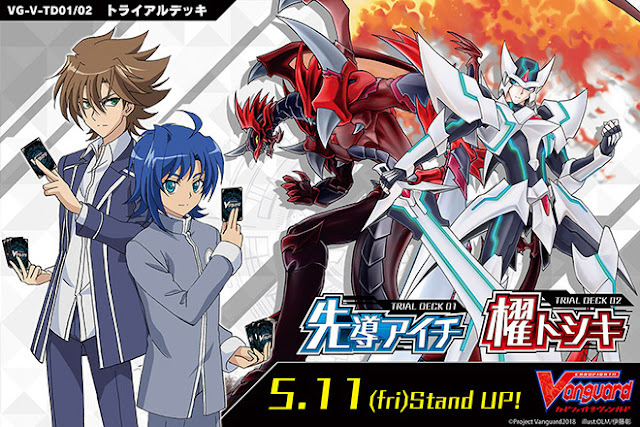 An RRR foil version is packaged with the Japanese bundle of V-TD02, and a set of 70 Kai Toshiki card sleeves. A means of obtaining them in English has yet to be announced. Has 1000 more base power than the demo deck Gojo, but the skill is identical. Automatic: When you ride over this unit, draw 1 card. 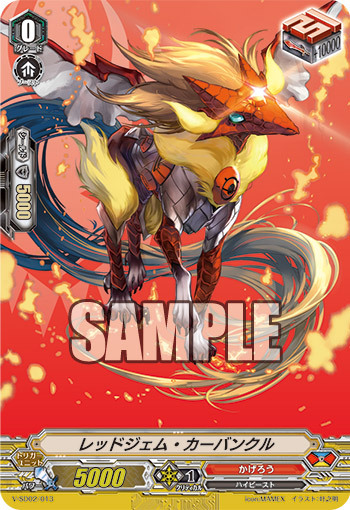 A statistically identical version with a different background is available in Start Deck 02, and a hotstamped special edition is available at day 1 of the Japanese Great Vanguard Festival on April 29th, 2018. "You may only have up to 4 cards with 'Heal' in your deck." First available in Start Deck 02.